Classic Barre is our signature barre class and perfect for beginners and experienced barre-goers alike! All classes consist of low impact, high intensity exercises targeting every muscle group in the body. Barre workouts are great for all ages and fitness levels because all moves can be modified and while exercises are tough on muscles, they are easy on joints. Class begins with a warm-up then light hand weights are used for arm exercises. Leg exercises are done using the barre for support. Class moves to the mat for seat, core and back work then ends with a cool down stretch. Classic Barre classes provide a total body workout that will tone, strengthen and lengthen from head to toe! Cardio Barre follows our Classic Barre format but adds more movement to the class to get your heart rate up and keep it there for the entire 60 minutes. Following each targeted section of the workout, (arms, legs & seat) we’ve added a 3 minute cardio interval to torch calories. Don’t like to jump? Don’t worry. All of our Cardio Barre classes provide low impact modifications for the cardio exercises that are still sure to make you sweat! Suspend Barre is a total body workout that adds exercises using the TRX suspension trainer. Similar to barre, suspension training workouts use your own bodyweight to increase strength, flexibility, core stability and balance. TRX training also sculpts long, lean muscles making it the perfect complement to barre. New to TRX? No need to fear, Suspend Barre introduces just a few TRX exercise per class so you can learn the new fitness modality at your own pace. 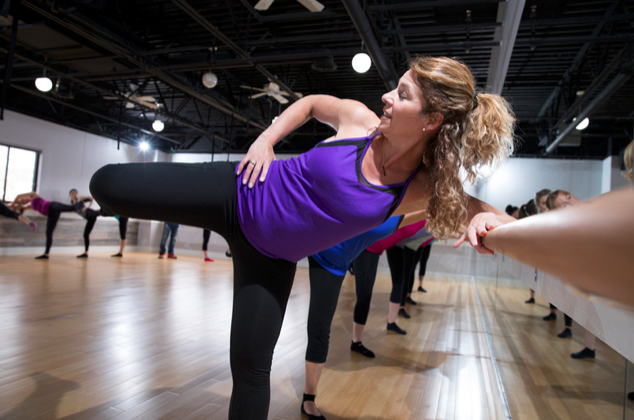 Kick, punch, squat, pulse and smile your way through a class so fun you’ll forget you’re working out. Burn calories while toning with this sculpting cardio workout! The class can be modified for all fitness levels. Mommy & baby barre classes are held in 5-week sessions and open to non-movers only, roughly ages 6 weeks to 7 months. A front carrier and blanket are required. Strengthen and tone muscles while having fun with your baby!